In addition to her roles as a voice actress, she also had small roles in Salute Your Shorts, the film Jerry Maguire, the NBC sitcoms Cheers and Wings and NBC medical drama ER, as well as cameos in The X-Files and Everybody Loves Raymond. Her family has not stated the cause of Christine's passing at the time of this article's writing. From all her work, one line leaps to the front of my mind. "Nasty as a one-eyed snake, sugar"
You guessed it, she was talking to a fox. A young fox. You see, foxes aren't inherently bad. We get corrupted in our youth. I'm glad I was. She delivered that line with sheer class, and every other show she worked on. I feel sorry for the generation growing up without the joy of Saturday morning cartoons and talent like Christine Cavanaugh. They missed out on the last traditional cartoons ever made. Rest in peace Christine. You'll be missed by many. It was the end 1995, and I was just beginning to discover this thing called 'The Internet'. One morning, I was watching cartoons, and Sonic the Hedgehog came on (TV down here was always a year or two behind the US). Now I must admit that I was never a huge fan of the games or of Sonic himself, so I started to do other things and not pay attention to it. Then, I heard a cute southern voice from a cyborg rabbit character, and it had my full attention. All too soon the show was over, but I watched again and again, week after week. She may have only been side character, but I was drawn to her and especially her voice. Not long after I did a search on the Internet for 'Bunnie Rabbot', and was surprised at all the results that came back as well as all the fan artwork. Most sites were linked to this strange thing called 'Furry'. I started to read about this, and found that nearly everthing applied to me. I was a Furry too! I started on MUCKs at first, but then I also found Furry friends both in my country and abroad. To this day, Bunnie Rabbot remains my favourite character. A symbol of something that changed my life for the better. I was lost and confused before, unsure of who I was or where I was going. But through the Furry community I found friendship and acceptance. I also found love. I followed Christine's career after that, watching her other works, and keeping an ear out for her voice. 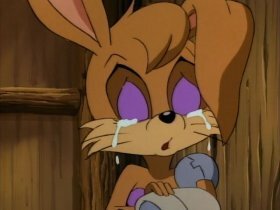 But for me, Bunnie is always the character I will remember her for. I was saddened to hear of her retirement from the industry in 2001. I had hoped she may return, but now she has passed, and Bunnie no longer has a voice. My thoughts go out to her family. The work that she did was a catalyst for a huge change in my life, and I will treasure that memory. He who know the ending of things when he is only beginning them is either extremely wise or extremely foolish; no matter which is true, he is certainly and unhappy man, for he has put a knife in the heart of wonder.